Wondering what to give your young children this holiday season that’ll be both fun and meaningful? Every kid loves a colorful picture book with a fun narration they can relate to, but so many children’s books depict non-AP scenes and situations – like a baby happily falling asleep in a crib or a four-year-old receiving a punitive timeout at preschool – that leave us parents scratching our heads and trying to explain why our families are different. The Warmest Place of All by Licia Rando, illustrated by Anne Jewett – there are a lot of warm places when Sophie comes in from playing outside in the snow, but none gives lasting warmth like a snuggle with her parents in their big bed. 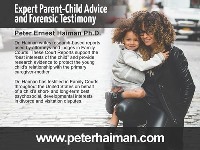 API members can check out an interview with Licia on The Attached Family online. Use the username/password sent to you via e-mail recently, or in the table of contents of the Summer 2009 issue of The Attached Family magazine, to access the website. Play with Me by Michael Elsohn Ross, illustrated by Julie Downing – All kinds of mommies and daddies play with their babies, from cats and dogs to even humans! Asi Me Siento Yo by Janan Cain, translated by Yanitzia Canetti – the Spanish version of The Way I Feel, you don’t even need to know Spanish to read this book! Illustrations and colors match every emotion so well that even small children can begin to learn how to label what they’re feeling. 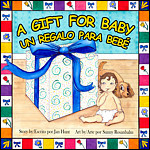 A Gift for Baby/Un Regalo para Bebe by Jan Hunt, illustrated by Sunny Rosanbalm – the bilingual English-Spanish version, this book offers the same support as the original to an expanded audience of conscious parents. 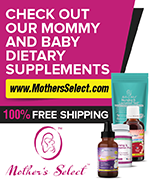 In the same vein as Licia’s new-release, Jan’s book follows along as Baby tries to guess what special gift is the big box – and it’s just what he wanted: Mommy! If My Mom Were a Platypus – available in English and Hebrew, this book explores how 14 different animals eat, sleep, and learn. Come Home Soon, Baby Brother! – a must-read coloring book for siblings of a baby in the Neonatal Intensive Care Unit. Look What I See! Where Can I Be? In the Neighborhood – see the daily routines of one AP family. I Was Born to be a Brother and I Was Born to be a Sister – with narration and sing-along songs, both CDs are good for siblings anticipating the birth of a new baby in the family. Of course, there are more AP books available in the publishing world. What books has your family found that are both representative of AP and that your kids love? These books look cute but, dare I say it, a little twee?